I read plenty of books in high school and college that I didn’t like much but only one that I actively loathed: The Sound and the Fury by William Faulkner. I could not see the point of a book that was so utterly incomprehensible. Our professor provided a reading guide that listed all the shifts in points of view by page number, and I still couldn’t make heads or tails of it. I’ve never minded a challenge when reading, but that was just too much. Plus, it was long. Most of the books I didn’t like were at least mercifully short. But knowing that Faulkner is considered one of America’s great novelists, I’ve told myself for years that I ought to give him another try, this time with one of his more accessible books. When my church’s book group chose As I Lay Dying to read, it was finally time for that second attempt. Imagine my surprise at how much I enjoyed reading about the mixed-up crazy-pants Bundren family of rural Mississippi. The book begins with the Bundrens preparing for the death of Addie, the family matriarch. Outside her window, eldest son Cash is carefully constructing her coffin, holding up the boards so she can see the wood he’s chosen. Sons Darl and Jewel are planning to run an errand that can earn them three dollars, but their father Anse is worried that Addie will die while they’re gone. Meanwhile, Dewey Dell, the only Bundren daughter, is worrying about her unplanned pregnancy, and youngest Bundren son Vardaman is applying a child’s illogical logic to the problem of death. When Addie does die, the family loads up the wagon and takes her the 40 miles to Jefferson to honor her wish to be buried with her people. One member of my book group noted that reading this book is like walking in at the middle of a movie, and that’s exactly how it felt. Each brief chapter is narrated by a different family member or a neighbor or stranger who observes their actions. The characters just share their thoughts in the moment; they don’t offer background or explanations. We must read between the lines to learn anything at all, sometimes even to get a handle on the basic events of the plot. I didn’t find this nearly as difficult as The Sound and the Fury. That is partly because I’m a better reader than I was 20 years ago, but I think it is an easier book. The shifts in perspective are clearly marked and there is a definite story, told mostly chronologically with moments of backtracking. Even so, I ended up reading the first third of the book twice because I wanted to get a grip on who these people are. The effort I put in to understand the Bundrens completely paid off. This family is all kinds of dysfunctional, and their travels put all their oddities on display. I got the most amusement out of Anse, who spends most of his time moaning about he was “ever a misfortunate man.” When his son Cash is lying on the ground, injured and vomiting after a disastrous river crossing, Anse continues to wail about his own misfortunate state. Anse moans almost continually about how he “don’t begrudge” Addie any of the pain this journey is causing. When neighbors try to help by offering shelter, Anse refuses to accept, not wanting to be beholden to anyone. But he changes his tune when he wants something, like the loan of a mule team or anything belonging to his children. He’s a piece of work, that Anse. As the journey continues, the family gets in increasingly serious scrapes, and with each scrape the comic potential increases right along with the disaster potential. Soon, the buzzards are following the wagon and the stench is causing strangers to remark on it. Honoring the dead is all well and good, but there’s something to be said for good sense. But good sense is just what the Bundrens seem to lack. One neighbor remarks, late in the Bundrens’ journey, “A man aint no different from a horse or a mule, come long come short, except a mule or a horse has got a little more sense.” The Bundrens are driven by a promise made to a troubled woman. Addie, there on the wagon and in her coffin, is guiding this whole journey. But a horse or mule will balk when urged to do something colossally stupid. Do the Bundrens balk? Not in any substantive way. Instead, they let Anse make them martyrs to his promise to Addie and urge everyone, including their mules and horses, toward disaster. The mules don’t have a choice, but the Bundren children do. Yet they keep letting Anse direct them. But I aint so sho that ere a man has the right to say what is crazy and what aint. It’s like there was a fellow in every man that’s done a-past the sanity or the insanity, that watches the sane and the insane doings of that man with the same horror and the same astonishment. Cash, the most deliberate and thoughtful–and largely ineffectual–member of the family, has it right. From a certain perspective, anyone’s actions could look insane. P.S. Just as I was getting into this book, Susan shared a link to Girl Detective’s amazing Lego diorama of a key scene in the book. I never would have thought Faulkner could inspire Lego creations, but I loved this! This is one of the books that began my mother’s game of shelving books next to each other so the titles are amusing–she saw The Sound and the Fury and As I Lay Dying next to each other on the shelf at the Hendrix College library. 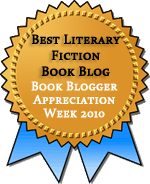 If you liked this novel, you might like some of the short stories. I really think the short story is Faulkner’s metier. I read a couple of his stories in high school, and I remember liking them. I’ll have to try more. That’s the only Faulkner I’ve ever completed myself. I once started The Sound and the Fury but quickly gave up. I know I tried another one for an online reading group, but couldn’t get past the first chapter. I think it was Absalom, Absalom but I’m not sure. Don’t know if I’ll ever attempt another of his books. I like classics but a book has to make sense to me at some point or I just won’t bother. I loved the Lego diorama too. Hilarious. I’d love to see more literary dioramas in Legos — there’s an entire book of Bible dioramas in Legos, it’s called The Brick Bible. Why not classics as well? Or how about Marshmallow Peeps? Yeah, if a book doesn’t make sense, I don’t see the point in continuing. It doesn’t have to make perfect sense, but there at least needs to be enough for me to enjoy. I just visited Faulkner’s house, Rowan Oak, in Oxford, Mississippi, as part of my Grand Southern Literary Tour. The only book of his that I had read was Absalom, Absalom. That was years ago and I could not begin to tell you what it was about. In preparation for this trip, I read a couple of Faulkner’s short stories. That is the way to go. Much more accessible. But if you don’t like reading about poor people (and I don’t) you might just read a few and let it go at that. Bill, the curator at Rowan Oak, told me that “more people are interested in reading about Faulkner that in reading Faulkner.” I think he may have something there. Ha! Yes, I can also imagine more people being interested in the idea of having read Faulkner than in the actual experience. I was surprised at how enjoyable this particular experience was, but from what I remember of the stories I read, they were much easier going. I just finished As I Lay Dying yesterday. I agree that it’s much less confusing then Sound and the Fury, but at times it was still hard to follow. Faulkner has a very specific style and it doesn’t always click with me. I’d say this is my favorite so far, but I’d really like to try his short stories. p.s. Love the Lego diorama! There were definitely parts I didn’t quite follow, but some of it (particularly Darl and Vardaman’s chapters) were supposed to be confusing, I think. Reading the first third twice and talking about it with a group helped a lot. I read Sound and the Fury in college and HATED it. I swore off Faulkner until Oprah (yes, I will admit it) picked Faulkner for her book club. I read As I Lay Dying and really liked it in fact some parts I even loved. 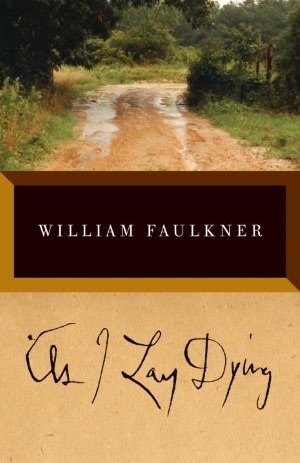 I always tell people if they hate Faulkner they have to read As I Lay Dying. It’s a great story with a family full of misfits and unfortunates and very accessible and not like The Sound and the Fury at all! Glad to hear you enjoyed it too. I like to give authors like Faulkner at least two chances, but it did take me a long time to try again. And as popular as it is to sneer about Oprah’s book club, I was impressed with many of her selections. In general, she didn’t choose junk. I read Absolom! Absolom! in college and while I didn’t hate it–as I expected to–I also haven’t read any more Faulker aside from short stories. This one is on my stacks. Great review! I don’t know how this compares to Absolom! Absolom!, but it’s a much better read than Sound and the Fury. Hope you enjoy it! I enjoy Faulkner, but I would never advise someone who hadn’t read any of his work to start with THE SOUND AND THE FURY, which I think of as atypical Faulkner and far too confusing (I had a college professor who claimed Faulkner was trying to out-do James Joyce when he wrote it). I would recommend starting with either THE OLD MAN/THE WILD PALMS (two novellas, sometimes printed together as companion pieces) or LIGHT IN AUGUST. Fun fact: The first (and only) time I got my legs waxed, all I could think of what the scene in AILD where the boy’s broken leg is set in cement (or is it concrete?) and how he screams when the case comes off–along with much of his skin. My husband likes to remind me that I may be the only woman in the world who could leave the house to get her legs waxed and return likening the experience to something that happened in a Faulkner novel. Light in August is the book I think I’ll try next, so I’m glad that you mentioned it as a good place to start. Your leg-waxing story cracked me up (as did the cement scene in the book).